‘Tis the season of giving and this year we are offering our supporters the opportunity to give the gift of a swimmable drinkable fishable future to their friends and loved ones. With your help, we will move more people to know and safeguard their local waters by creating platforms based on law, science, education, and communications technology. Each year we respond to nearly 100 pollution reports around the Great Lakes. On top of reporting and documenting each spill our staff analyses all reports that we receive to find patterns and identify the sources of pollution as we work towards finding solutions that will make our waterways swimmable, drinkable, and fishable. On average each report costs our organization $500 including staff time, testing materials, documentation and travel costs. Your gift will ensure that we can respond to spills when they happen. Monthly giving provides our organization with much needed regular funding that allows us to expand our programs. Your gift of $25/mth will help us to empower more communities to know and safeguard their waters. From the beginning, we've counted on the generosity of our donors like you. Your one time gift at this critical time of year helps us identify threats to swimmable, drinkable, fishable water and develop solutions that address the root problem. Visit our store and choose the donation that fits your budget. 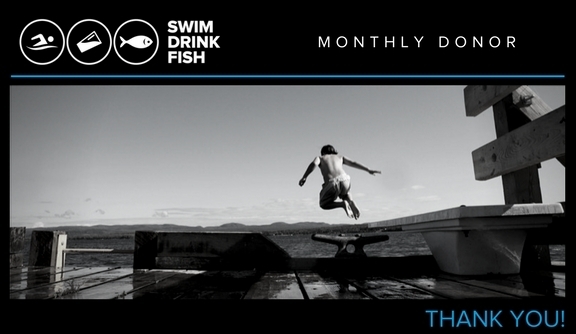 Together we can make 2018 the biggest year yet for Swim Drink Fish Canada!